CEE-LINE™ Case History from GIS Surveyors, Inc USA. Surveying Lake Eleanor near Thousand Oaks, California called for a simple and easy method. The small lake was perfect for a kayak, and GIS Surveyors’ Gavin McKellar outfitted the boat with a trolling motor so he could survey without excessive roll movement. 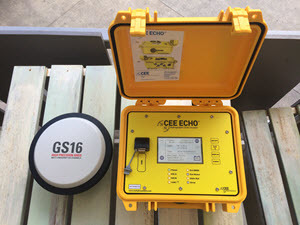 The CEE-LINE™ echo sounder was connected to a Trimble TSC3 data collector and continuous topo points were collected from the R10 GNSS receiver as Gavin undertook a survey grid pattern covering the lake. Read the full case history HERE or watch GIS in action on the VIDEOS page. CAJUN-USV in Action on Lake Pontchartrain, Louisiana USA. Destined for effluent pond surveying in the paper mill industry throughout the south eastern USA, the NovAtel DGPS equipped CEE-USV™ adds rapid mobilization capability to traditional manned-boat survey services. Running HYPACK software on the shore laptop, real time telemetry from the on-board CEESCOPE-LITE™ survey system presents an identical acquisition method whether using the USV or the manned boat. Before embarking on their first industrial water job using the USV, the field crew tested the system on a bayou off Lake Pontchartrain. Icy Training with BayLand Consultants & Designers Inc. in Baltimore. Surveyors at the Maryland, USA firm recently augmented their hydrographic surveying capabilities with a new CEE ECHO™ and HYPACK acquisition software. With years of surveying experience using various methodologies, BayLand decided to expand their survey capabilities in 2019 with a classical hydrographic survey approach. During the CEE HydroSystems training event in Baltimore, January cold weather meant the BayLand pontoon boat was called into action as an icebreaker. However, a successful outcome was reached as a high quality HYPACK hydrographic survey was completed just a week later. Read the NEW CASE HISTORY HERE. More River Monitoring USVs for California Department of Water Resources. Hydrologists from the CA DWR Central region are the latest group to benefit from remotely-operated acoustic Doppler velocity profiling courtesy of ARC-Boat USVs supplied by CEE HydroSystems USA. With typically low to moderate flow velocities in the region, the vehicle’s fine-tuned rudder and differential steering capability allows precise navigation even in the lowest flows. Set up to deploy Sontek M9 profilers with the River Surveyor software, hydrologists quickly were able to get to work monitoring early 2019 rains. CEE-USV Surveying on the Trans Alaska Pipeline System (TAPS). Surveyors and engineers responsible for the crude oil pipeline stretching 800 miles from the tanker port of Valdez to the oilfield at Prudhoe Bay experienced a quantum leap in field work efficiency and data quality with the implementation of a USV survey program using the RTK CEESCOPE-enabled CEE-USV. With pipeline crossing surveys required annually along the length of the pipeline, the USV approach is a perfect match. WATCH THE VIDEO. Integrated CEE Surveying Solution for Safe River Navigation. A river transportation company pushed their safety culture further forward with a high quality hydrographic survey program to manage river barge movements in the huge inland river system of the United States. The seamless interface between the CEESCOPE echo sounder, RosePoint ECS navigation and Hydromagic acquisition software allows easy production of “on the fly” charts. LEARN MORE. Australian Land Survey Firm Start Hydrographic Services with 66km River Survey. New South Wales Survey and Planning firm Newton Denny Chapelle (NDC) recently called on CEE HydroSystems to get them up to speed with modern hydrographic methods and equipment. Starting with a river survey using their existing Leica GNSS equipment paired with the latest CEE echo sounders, NDC were able to see the benefits of an updated approach. READ MORE. Historic Naval Dockyard Starts Hydrographic Surveys with RTK CEESCOPE™. Mare Island Dry Dock (MIDD) near Vallejo California, USA is on the site of a historic naval dockyard on the Napa River. With rapid sediment accumulation at the berths and caissons, routine dredging is needed. Instead of calling out a survey contractor, MIDD decided to start up their own “in house” survey capability. With the RTK CEESCOPE™ accessing local California Real Time Network NTRIP corrections through HYPACK® software, the MIDD survey boat was in action after only three days on-site CEE training. Learn more and read the new CASE HISTORY HERE. Synergy Positioning Systems Become CEE HydroSystems Resale Partner. GNSS and drone equipment specialist Synergy Positioning Systems in New Zealand are the latest CEE partner, offering our full range of high quality hydrographic solutions. To visit Synergy Positioning, click HERE. Five Hours of On-Line Hydromagic Training Now Available. New tutorial videos are available for all aspects of hydrographic surveying using Eye4Software Hydromagic only directly from CEE HydroSystems. Learn more HERE. SBG Systems Ellipse2-E INS and WiFi Connectivity Added to CEESCOPE™ for Jet Ski Surveys. Designed for Personal Watercraft (“Jet Ski” – PWC) hydrographic surveying using HYPACK®, CEE HydroSystems’ latest CEESCOPE™ echo sounder adds a direct interface to the SBG Systems Ellipse2-E GNSS aided Inertial Navigation System (INS) and high-power WiFi telemetry to create an even more flexible single beam “all in one” survey package. The latest CEESCOPE-R™ variant represents a particularly appropriate and unique solution for surf zone hydrographic surveying. Learn more HERE. USV Hydrographic Surveying – From the Land Surveyors Perspective. Often surveying with unmanned survey boats such as the CEE-USV™ is described by hydrographic surveyors or marketing specialists for the equipment manufacturers. The June 2018 edition of the US survey magazine xyHt featured a great article contributed by surveyors at Statewide Land Surveying in Oregon, USA describing their hydrographic exploits using the CEE-USV™, compared to historically (difficult) methods. Download the PDF HERE or visit the xyHt web site HERE. CEE HydroSystems Supply Jet Ski Single Beam RTK Survey Package. CEE HydroSystems recently supplied a unique single beam hydrographic survey package for shallow water surveys to be performed using a Jet Ski by a French survey firm on behalf of an oil major. Instead of a complete “turnkey” survey personal watercraft, CEE supplied a portable “add on” survey pack that the client could easily mount onto an existing craft. Using the unique compact CEESCOPE™ RTK as the foundation for the system offered a small form factor solution with a waterproof design ready for the rigors of surveying in the surf zone and beyond. Learn more HERE. CEESCOPE Echo Sounder Now Available With NovAtel OEM7 555-Channel GNSS. The NovAtel OEM6 GNSS receiver card used in the CEESCOPE has been replaced with NovAtel’s latest low power, high performance OEM729 receiver. The new GNSS option brings a vast increase in available channels for future-proofing, improved interference rejection, and better performance in challenging environments. The TerraStar L-Band support remains and the OEM729-equipped CEESCOPE is available with a built-in UHF radio modem and direct Ethernet connectivity to the GNSS receiver for NTRIP cell-phone RTK corrections. Learn more about the OEM729 receiver HERE. CEE HydroSystems in Myanmar for Hydrographic Survey Training. In support of a major World Bank hydrographic survey equipment initiative in Myanmar, CEE HydroSystems was on hand to provide two weeks of intensive hardware and software training for local Directorate of Water Resources and Improvement (DWIR) hydrographers. Using the latest Trimble CEESCOPE™ with RTK “all in one” single beam survey echo sounder systems and HYPACK® software delivered by CEE HydroSystems, the survey department quickly were able to start their single beam survey program. READ MORE. Next Wave of CEE-USV™ Survey Boats Arrives – and Leaves. The latest batch of safety-green colored survey boats has washed up on the shores of Southern California for customers in the USA. Set up for single beam hydrographic surveys or ADCP velocity profiling, the latest group of vehicles are destined for state and government agencies and private survey firms. Three of the boats include the latest telemetry-enabled CEESCOPE-LITE™ USV data system. Surveying with the CEESCOPE on the E-Flow Project Bhutan. If you have ever wondered about surveying a flushing toilet then this challenge probably comes close. There was no easy way to obtain bathymetry data for the river surveys and Bhutanese surveyors were tested in fitness as well as hydrographic data collection. The RTK CEESCOPE was used for river bed elevation measurements with all data logged on the echo sounder as the operators had other things to worry about than operating a laptop. NEW CASE HISTORY. CEE-USV Mine Site Surveying in British Columbia, Canada. For bathymetry surveys of settling ponds, pit lakes, tailings dams and other water reservoirs where access is restricted or unsafe, the CEE-USV presents a perfect solution. Coal mine surveyors in Western Canada kicked off their new USV program with three unmanned surveys during the CEE on-site training course with plenty more to follow including coal tailings deposition reservoirs. WATCH THE VIDEO. CalTrans Developing New Scour Assessment Methods using Inertial Navigation and GPS. Conducting effective bathymetry surveys for bridge scour monitoring is hampered by a lack of GPS coverage under the bridge. Bad data, no data at all, or laborious manual measurements producing sparse data are the usual options. CalTrans are using their CEE single beam echo sounder with an Advanced Navigation INS sensor to improve their bridge scour hydrographic surveys and minimize missing data. LEARN MORE. Statewide Land Surveying Use CEE-USV for Oregon Marina Surveys. As part of their new unmanned vehicle surveying program, Statewide’s new CEE-USV hydrographic survey boat was in action performing a pre-dredge survey at Detroit Lake in Oregon, USA. Able to weave between the hundreds of moored boats in the marina, the CEE-USV was the perfect way to maximize coverage in the confined spaces of the survey. See more of the marina survey HERE. 2017 CEE HydroSystems USA Hydrographic Field Training. The summer survey season is the busiest time for CEE’s customer field training. From experienced land surveyors to users with no previous survey experience at all, new CEE customers in North America benefit from field training to get their hydrographic survey programs effective and efficient without delay. Including HYPACK and Hydromagic training, introduction to hydrographic survey methods, GPS setup and integration, and boat operation, new users are not left scratching their heads after opening their new echo sounder delivery! See some examples of CEE survey setups HERE. CEE HydroSystems USA Delivers ARC-Boats to California State Hydrologists. To improve safety, efficiency and measurement flexibility in their stream and river gauging program, California State Department of Resources has begun implementing a drone survey capability using the HR Wallingford ARC-Boat remotely-operated acoustic Doppler current profiler vehicle. ARC-Boats are already in action at the Sacramento and Red Bluff offices and present an exceptionally well designed, high performance survey tool for flood stage and routine measurements. See the ARC-Boats in action HERE. Los Angeles Times – CalTrans use CEE Echo Sounders for Bridge Scour Surveying. The LA Times filmed a segment about ongoing surveying of California’s bridge infrastructure by California’s Department of Transportation. The hydrographic survey program aims to better understand risks to highway bridge integrity from scour during high flow conditions, and incorporates evaluation of novel techniques to aid scour surveying. Senior Bridge Engineer Kevin Flora explains to the LA Times details about their program, which relies on CEE HydroSystems single beam echo sounding and Trimble GNSS equipment. Watch CalTrans in action HERE. CEE HydroSystems Launch CEE LINE™ Echo Sounder Kit. Packaged into a complete mounting kit for basic hydrographic surveys, the latest CEE LINE™ is aimed at land surveyors wishing to undertake small hydro projects. With the CEE LINE, you don’t have to make do with a rudimentary echo sounder for a basic survey. The CEE LINE is almost bomb proof, has a simple communication interface and does not ever need charging courtesy of its USB connection. No trimmed down performance specs or recreational transducers here – professional grade components only! The “sonar on a stick” concept has been around for a few years but the CEE LINE offers a quality-first approach to this survey setup. LEARN MORE. CEESCOPE™ and CEE ECHO™ with New Bluetooth GNSS Input Delivered to USACE. New firmware launched in April 2017 activates direct GNSS data input from any Bluetooth-enabled Smart Antenna (eg. Trimble R8, R10, SPS, Leica GS, Hemisphere S320, S321, TopCon Hiper, Topcon GR5) that can output a standard NMEA message over a Bluetooth link. Instead of connecting a serial data output cable between the GNSS serial or USB port to the echo sounder, users may choose to pair the devices using the CEESCOPE touchscreen and operate in wireless mode for RTK, L-Band, or DGPS surveys. The most modern, flexible survey echo sounder just got more flexible! The first three CEE ECHO units with the new firmware were shipped to the Louisville USACE district to replace ageing single beam equipment, through CEE HydroSystems representative Measutronics. Hydroline LLC Set New Standard in Frac Water Volume Surveys. With a custom-designed one-person survey boat using the CEESCOPE™ echo sounder system and HYPACK® software, Lousiana-based oilfield support company Hydroline LLC are able to offer the best frac water volume surveys in the region. Using professional hydrographic-quality hardware, software, and survey processes, Hydroline customers get accurate and trustworthy frac water volume estimates. Read the CASE HISTORY to LEARN MORE. CEE HydroSystems USA Launch CEE-USV™ Remotely-Operated Hydrographic Survey Boat. Matching the unique CEESCOPE-USV™ remote echo sounder technology with the leading portable USV from HR Wallingford has led to the new standard in remote drone bathymetry. With exceptional “survey grade” durability and an unparalleled modular flexibility and ease of operation unlike any USV on the market, the CEE-USV™ sets the new standard for shallow water hydrographic systems. LEARN MORE. Swathe Services (Truro, UK) conduct bathymetric survey for the Port of Tarragona. Swathe surveyors used their new Belisama Inception remotely-operated survey boat “drone” with CEE HydroSystems RTK CEESCOPE-USV single beam echo sounder and telemetry package on board. With shallow water and restricted access, the job was ideal for a small USV. MORE. American Engineers Inc. Offer Hydrographic Surveying with State-of-the Art CEE USV. Incorporating the unique CEESCOPE-USV echo sounder, CEE USA recently delivered a custom remotely-operated unmanned surface vessel (USV) to engineering and surveying firm AEI. With an unrivalled simplicity in operation owing to the modular and advanced design, AEI are at the forefront of inshore USV technology. READ MORE. NewFields present sonar paper at Tailings and Mine Waste Conference 2016. Using detailed “HD” dual frequency echo sounder data from their CEE ECHO™ deployed on a USV, NewFields surveyors are able to track tailings storage facility (TSF) bathymetry as a new TSF evolves, and use the sub bottom echogram data to better understand tailings deposition processes and material distribution inside the TSF. READ THE NEWFIELDS PAPER. PrimeGPS Become CEE HydroSystems Representative in France and Africa CEE HydroSystems recently signed a representation agreement with positioning and hydrographic equipment distributor PrimeGPS. Based in Sainte Luce Sur Loire, PrimeGPS supply survey equipment to the offshore, construction, mining, and dredging industries in Europe and French-speaking African countries. CEE HydroSystems shallow water survey news is a useful resource for hydrographic survey-related information and specifically single beam echo sounder surveys in shallow water. If you have any news related to CEE HydroSystems equipment being used on surveys around the world then please contact us. We would greatly appreciate the chance to pass on news of survey activities in varied and interesting environments. If you have managed to solve a survey problem with an innovative approach, or constructed a custom survey platform, vessel, or installation then we are particularly keen to find out about it. In addition you will be able to see news updates relating to our hydrographic survey equipment and ancillary devices such as echo sounders, tide gauges, sound velocity profilers, and hydrographic software. If we come across useful software tips for HYPACK® or Eye4Software Hydromagic then we will include them to allow for future referencing as appropriate. To see PDF versions of news articles visit THIS PAGE.